The characteristic fragrance and flavor of ginger result from volatile oils that compose 1-3% of the weight of fresh ginger, primarily consisting of zingerone, shogaols and gingerols with -gingerol (1-[4'-hydroxy-3'-methoxyphenyl]-5-hydroxy-3-decanone) as the major pungent compound. Zingerone is produced from gingerols during drying, having lower pungency and a spicy-sweet aroma. 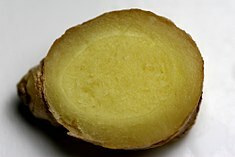 Shagoals are more pungent and have higher antioxidant activity but not found in raw ginger, but is formed from gingerols during heating, storage or via acidity. ^ "Zingiber officinale". Germplasm Resources Information Network (GRIN). Agricultural Research Service (ARS), United States Department of Agriculture (USDA). Retrieved 10 December 2017. ^ a b c d e f "Ginger, NCCIH Herbs at a Glance". US NCCIH. 1 September 2016. Retrieved 2 February 2019. ^ Sutarno H, Hadad EA, Brink M (1999). "Zingiber officinale Roscoe". In De Guzman CC, Siemonsma JS (eds.). Plant resources of South-East Asia: no.13: Spices. Leiden (Netherlands): Backhuys Publishers. pp. 238–244. 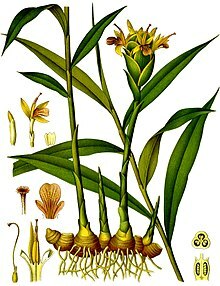 ^ a b "Zingiber officinale Roscoe". Kew Science, Plants of the World Online. Royal Botanic Gardens, Kew. 2017. Retrieved 25 November 2017. ^ "Ginger". Online Etymology Dictionary. Douglas Harper. Retrieved 22 January 2011. ^ Caldwell R (1 January 1998). A Comparative Grammar of the Dravidian Or South-Indian Family of Languages (3rd ed.). New Delhi: Asian Educational Services. ISBN 9788120601178. ^ Ross M (2008). "Other cultivated plants". In Ross M, Pawley A, Osmond M (eds.). The lexicon of Proto Oceanic: The culture and environment of ancestral Oceanic society. Vol. 3: Plants. Canberra: Pacific Linguistics. pp. 389–426. ISBN 9780858835894. ^ a b Robert B, Trussel S (2013). "The Austronesian Comparative Dictionary: A Work in Progress". Ocean. Linguist. 52 (2): 493–523. doi:10.1353/ol.2013.0016. ^ Zanariah U, Nordin NI, Subramaniam T (2015). "Ginger Species and Their Traditional Uses in Modern Applications". Journal of Industrial Technology. 23 (1): 59–70. doi:10.21908/jit.2015.4. ^ Kikusawa R, Reid LA (2007). "Proto who utilized turmeric, and how?" (PDF). In Siegel J, Lynch JD, Eades D (eds.). Language Description, History and Development: Linguistic indulgence in memory of Terry Crowley. John Benjamins Publishing Co. pp. 339–352. ISBN 9789027292940. ^ Mahdi W (1999). "The Dispersal of Austronesian boat forms in the Indian Ocean". In Blench R, Spriggs M (eds.). Archaeology and Language III: Artefacts languages, and texts. One World Archaeology. 34. London: Routledge. pp. 144–179. ISBN 9780415518703. ^ Beaujard P (2011). "The first migrants to Madagascar and their introduction of plants: linguistic and ethnological evidence". Azania: Archaeological Research in Africa. 46 (2): 169–189. doi:10.1080/0067270X.2011.580142. ^ a b "Ginger production in 2016, Crops/Regions/World/Production/Quantity (from pick lists)". FAOSTAT. FAO, Statistics Division. 2017. Retrieved 8 May 2018. ^ a b "Aristolochic Acid: FDA Warns Consumers to Discontinue Use of Botanical Products that Contain Aristolochic Acid". US FDA. 11 April 2001. Archived from the original on 3 June 2017. ^ "Nutrition facts for dried, ground ginger, serving size of one tablespoon, 5 grams (from pick list)". nutritiondata.self.com. Condé Nast. 2014. Retrieved 11 June 2017. ^ "Code of Federal Regulations, Title 21, Part 182, Sec. 182.20: Essential oils, oleoresins (solvent-free), and natural extractives (including distillates): Substances Generally Recognized As Safe". US FDA. 1 September 2014. Retrieved 21 December 2014. ^ Shalansky S, Lynd L, Richardson K, et al. (2007). "Risk of warfarin-related bleeding events and supratherapeutic international normalized ratios associated with complementary and alternative medicine: a longitudinal analysis". Pharmacotherapy. 27 (9): 1237–47. doi:10.1592/phco.27.9.1237. PMID 17723077. ^ a b c An K, Zhao D, Wang Z, et al. (2016). "Comparison of different drying methods on Chinese ginger (Zingiber officinale Roscoe): Changes in volatiles, chemical profile, antioxidant properties, and microstructure". Food Chem. 197 (Part B): 1292–300. doi:10.1016/j.foodchem.2015.11.033. PMID 26675871. ^ a b Giacosa A, Morazzoni P, Bombardelli E, et al. (2015). "Can nausea and vomiting be treated with ginger extract?" (PDF). Eur. Rev. Med. Pharmacol. Sci. 19 (7): 1291–6. ISSN 1128-3602. PMID 25912592. ^ Lee J, Oh H (2013). "Ginger as an antiemetic modality for chemotherapy-induced nausea and vomiting: A systematic review and meta-analysis". Oncol. Nurs. Forum. 40 (2): 163–170. doi:10.1188/13.onf.163-170. ISSN 0190-535X. PMID 23448741. ^ Matthews A, Haas DM, Mathúna DP, et al. (2015). "Interventions for nausea and vomiting in early pregnancy". Cochrane Database Syst. Rev. (9). CD007575. doi:10.1002/14651858.cd007575.pub4. PMID 26348534. ^ Ernst E, Pittler MH (2000). "Efficacy of ginger for nausea and vomiting: a systematic review of randomized clinical trials". Br. J. Anaesth. 84 (3): 367–371. doi:10.1093/oxfordjournals.bja.a013442. PMID 10793599. ^ Pattanittum P, Kunyanone N, Brown J, et al. (2016). "Dietary supplements for dysmenorrhoea". Cochrane Database Syst. Rev. 3 (3). CD002124. doi:10.1002/14651858.CD002124.pub2. PMID 27000311. ^ Terry R, Posadzki P, Watson LK, et al. (2011). "The use of ginger (Zingiber officinale) for the treatment of pain: A systematic review of clinical trials". Pain Medicine. 12 (12): 1808–18. doi:10.1111/j.1526-4637.2011.01261.x. PMID 22054010.